The HP Agilent 8453 UV-Vis spectrophotometer G1103A offers you fast results and repeatability in a compact footprint. This photodiode spectrophotometer eliminates scanning and measures across the ultra-violet to visible light spectrum to return spectral acquisition and analysis in less than one second. This UV-Vis spectrophotometer has stable optics and low noise with no moving parts, eliminating variables to get you reproducible results. This spectrophotometer has a wavelength before 190-1100 nm, and a 1nm slit width, cutting down on stray light to < 0.03 %. The Agilent 8453 UV-Visible spectrophotometer supports compliance with GLP regulations, with its own clock for time and date stamps and self-test procedures to make sure performance is consistent in between validations. 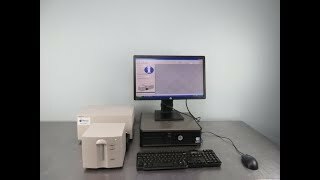 This spectrophotometer has an open sample area for easy loading of samples and makes large accessories easy to use. This system is ideal for labs needing to conform to GLP regulations, or for more generalized tasks. Users of this uv-vis spectrophotometer are guided through a graphical interface, that provides at a glance confirmation of actions and statuses, and quick access to frequently used programs. This Agilent 8453 Spectrophotometer is partnered with a multicell transport, to help boost productivity in repetitive situations or when you want to follow changes in several samples. This 8-cell position transport can randomly access all positions moving between them in under 1 second, and a ± 0.1 mm position repeatability. < 0.001 A/h at 0 A, 340 nm, after 1-hour warm up, measured over 1 hour, every 5 seconds, constant ambient temp. This Agilent 8453 UV-Visible spectrophotometer has been fully inspected and comes with a clean bill of health. All of our lab equipment comes backed with our standard warranty. Should you have any questions, please don't hesitate to contact us.